Objective: To determine whether vitamin D supplementation improves non-traditional cardiovascular risk factors such as Apo B levels among indigenous children. Methods: A prospective two-year study evaluated a treated cohort of 190 children (104 males) aged 9.4+ 2.2 years. Children were divided into group A (n=104; 54.7%) and group B (n=86; 45.3%). Both groups received vitamin D supplementation with 100,000 u/year; group B was treated in 2013 and group A in 2014. All subjects were evaluated at the end of each treatment and anthropometric measures, lipids and vitamin D levels between the two groups were compared. Results: Changes in vitamin D levels were significantly higher in Group A, which was supplied in 2014, than in group B, which was not supplied in 2014 (6.8 vs 0.96 ng/dL; respectively). Levels of LDL-C and Apo B were improved in group A versus B: LDL-C (-5.7 vs 6.9 mg/dL respectively) and Apo B (-0.9 vs 11. mg/dL respectively). 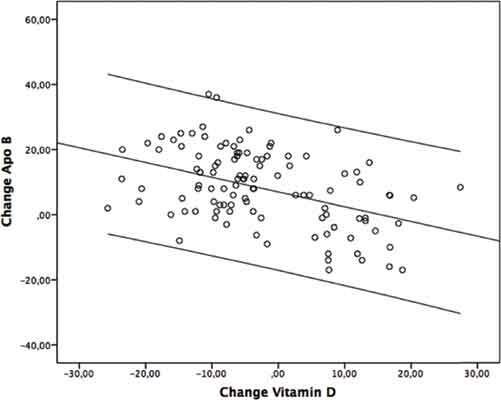 Several multiple regression linear analyses showed that changes in vitamin D were significantly associated with lower LDL-C levels (Beta- 0.41, p<0.01; R2 0.07); and with lower Apo B levels (Beta-0.37, p<0.01; R2 0.17). Conclusion: Vitamin D supplementation among indigenous children could improve Apo B levels. Apo B levels, indigenous children, vitamin D supplementation, cardiovascular risk, indigenous, children, apolipoprotein. From the University of Buenos Aires, Argentina Maipu 812 5 M Buenos Aires (1006), Argentina.